If you have lived gluten-free for a while now, you are likely intimately familiar with the trial-and-error experience that is the holidays. Even the most well-meaning hosts slip up, or another dinner guest gets ham-handed (after a few glasses of wine, who doesn’t) and drops a roll in the pan of gluten-free stuffing. What’s a hungry celiac to do? This year, take Thanksgiving into your own hands. And make it the best darn gluten-free dinner your guests have ever had… possibly without even realizing. There is a lot of advice floating around out there about the best, BEST recipes and unbelievably-delicious-but-totally-not-difficult substitutions. But ultimately, before testing an untried dish, or trying to figure out which silver bullet tips aren’t hogwash, start with the basics: what simplifies cooking, and how can you look out for potential pitfalls. 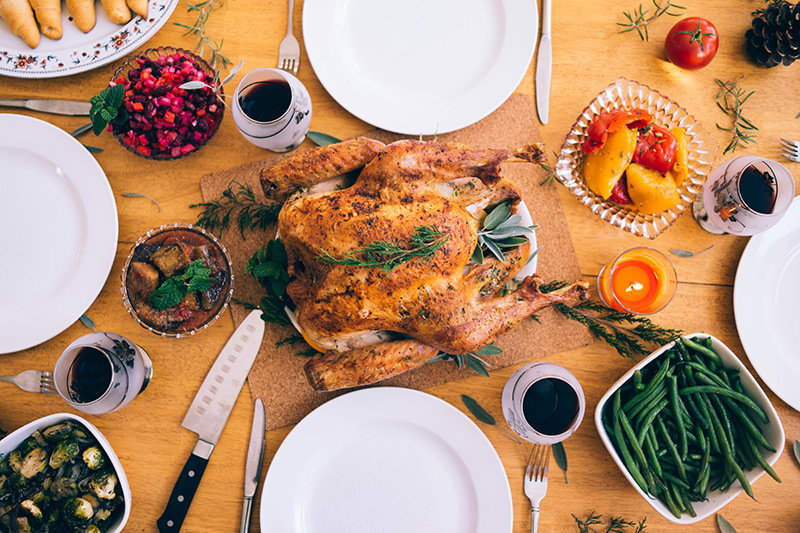 If this is your first gluten-free Thanksgiving – either as guest or host – expert blogger Gluten-Free Girl wrote a great primer for facing the holidays, both as a cook and as someone potentially in need of a morale boost (know the feeling?). Her finest piece of advice: don’t focus on what you can’t have, or get caught up in trying to reshape an old favorite using complicated substitutions. So many Thanksgiving dishes – when made from scratch – are naturally gluten-free. And those that aren’t? Well, we have some suggestions coming. Feel physically and emotionally ready to tackle the menu? Here we go! Yes, turkey is naturally gluten-free. So why is it in this post? Because who doesn’t need a little advice about perfecting their roasting approach! Although, that said, don’t assume all turkeys are created equal. Even cooked gluten-free, the raw bird may have been injected with gluten-containing broth prior to purchase. Check out this list of gluten-free turkeys to be sure! Novice? Try this basic and ultra-easy how-to from The Kitchn. It’s not stuffed with any fancy aromatics, and relies on the classic basting technique of yore. Comfortable in the kitchen? This classic recipe from Ina Garten incorporates all your favorite poultry seasonings with fresh citrus, garlic and onions! Ready to take it to the next level? If you’re thinking ahead, this easy-to-follow tutorial on brining from Alton Brown is brilliant. It’s not actually difficult to execute, but does require forethought and planning, particularly if you purchase your bird frozen. The effort is worth it, though: you’ll never have a moister, more flavor-filled turkey. Luckily, a good stuffing is just as delicious cooked separately. The key? Stop trying to imitate those traditional stuffings made with French bread and other crusty loaves. Instead, use cornbread. The taste and texture of a good cornbread isn’t as dependent on wheat flour and, in fact, some don’t require flour at all. For two excellent starter recipes, check out these suggestions from Epicurious, or upgrade to this Apple-Pecan Cornbread Stuffing from The New York Times. Pro Tip: if your chosen cornbread recipe does call for flour, take a peek at this list of gluten-free flour formulas compiled by the Celiac Sprue Association before getting started. Very useful for any kind of cooking/baking! Yes, you can make gravy from scratch. No, you don’t need a mix. Yes, your favorite gluten-free flour will work as a thickener, BUT: the key is to dissolve it before adding it to the gravy mixture. Blending with cream or creating a roux first prevents clumping. Need a delicious how-to? See what the experts at Bon Appetit had to say. There are two ways to approach this one: find the perfect gluten-free pie crust or go crustless completely. If the latter has you imagining eating a plate of gelatinous pie-filling, trust us: this path is full of potential. Try this pumpkin mousse parfait that not only presents beautifully, but is so rich and full of flavor you (and your wheat-eating guests) won’t miss the crust. Or hey, if you aren’t a pie person at all, skip it entirely! Serve up after-dinner coffee or espresso with a selection of naturally gluten-free macarons. This recipe from Martha Stewart is a simple way to get started, and will make you feel très chic. All that said, if you just can’t give up on having that buttery complement to your favorite filling, it’s okay! Where there’s a will, there’s a way. This crust recipe from Gluten-Free Girl is not only precise, but comes with great baking advice! Simply make and fill with your favorite pie fruits or other fillings, or follow her complete Cranberry Pie recipe. Pro tip: like Gluten-Free Girl suggests, a food scale may be worth the investment if you plan on making gluten-free baking a habit. If you are hosting and have made an entirely gluten-free menu, kudos! You’re almost guaranteed to have a safe and delicious gathering. ● Don’t simply label gluten-free dishes and place them alongside grain-containing ones on the table or buffet. Things drip and roll off plates, bread crumbs are shed and spoons have a way of making it out of one dish and into another. Avoid cross-contamination by serving gluten-free foods at a completely separate table or in the kitchen, and allow gluten-free diners to serve themselves first. ● Don’t assume the person who is cooking will be as educated about gluten-free needs as you are, no matter how hard they try. The Savvy Celiac wrote a great article for sharing with well-meaning friends and family to prep them for cooking for someone on a strict gluten-free diet. That’s all we have for now! If you have great holiday survival advice, or a favorite go-to recipe that always wins, share them with us in the comments! Happy Thanksgiving, all.